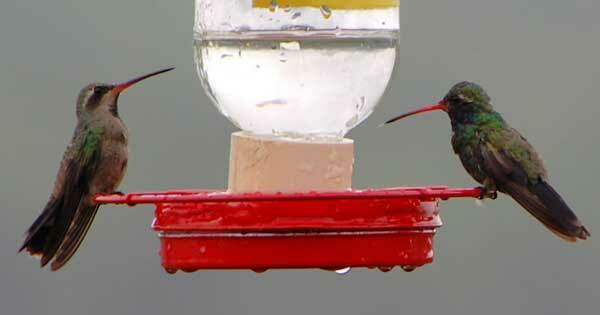 This female is on the left and the male on the right at this sugar feeder in Patagonia, Sta. Cruz Co., Arizona, USA. 31 July 2010. This colorful hummingbird is common during the summer in the canyons of southeastern Arizona. It is rare noth of Tucson. Both the male and the female have wings and backs that are bright, irridescent green and blue. The male's bill is redder than the female's. In addition the female has a conspicuous band of white that extending back from the eye.